"Return gift Maa for Your Smile :-)"
This is the most demandable sweet of most Bengalees, which one can never get in any sweet shop but only in some small native shops or 'dashakarma bhandar - দশকর্মা ভান্ডার' in Kolkata, but Bengalees feel more eagerness in having homemade narus rather than those readymade coconut balls. Actually it is a perfect gift for your loving and caring ones. 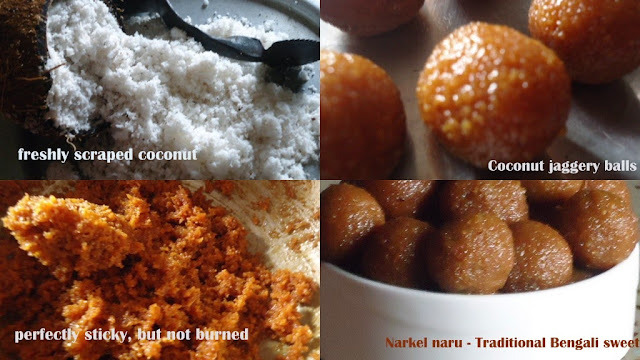 Qualifies for the must have ingredients in the lakshmi puja prasad. Needs some strenuous attempt and courage to make, and I think that once in a year when we are ready to beat cakes in the winter why not scrap coconut in the autumn. Here goes an authentic recipe for a traditional sweet. Let them praise and enjoy your love. 1. Mix warm water with molasses to form a liquid. Heat it and boil for 5 minutes and strain through a muslin sieve to remove dust particles from the molasses. 2. Now take a fresh karahi and heat the cleaned sugarcane molasses on low fire. Stir occasionally. As it boils, scum will rise to the top. Scoop this off with a spoon. 3. Boil the molasses until dark and thick. Stir occasionally, do not let it burn. 4. Add scraped coconut and stir continuously until its become dark, dry and sticky and it could be collected on the ladle. 5. Now you may remove the pan from the heat and let it cool down 70% so that you can touch the coconut molasse mixture comfortably. 6. Grease your both hands with a little oil and take one spoon of the mixture, roll to make ball, continue until done completely. 7. Usually if the mixture cools down completely it can be too hard to make a ball, then again it should be heated slightly to gain a sticky mixture. 8. Commercial coconut powder lacks the natural moisture and oil and hence misses out on the traditional touch of the recipe.